A contract was closed last night for the erection of a mammoth 250-barrel, full roller flouring mill with all the latest machinery in this city. The promoters are W.C. Howard, J. Rauch and S.T. Stratton. It will be called the Empire Mills. 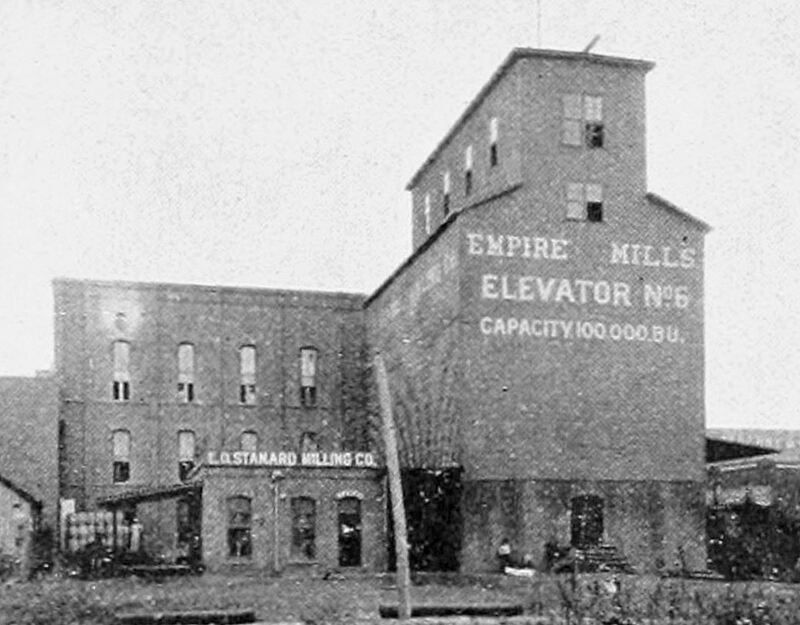 The mill opened in September, with the company’s proclamation that their new “roller mills” were “the largest and finest ever erected in the South.” It was located at Elm and Broadway, near the Trinity River. In a newspaper interview, John Neely Bryan’s son described the location of his father’s famous cabin as being “at the top of the hill, about where Empire mills are now located” (Dallas Morning News, Aug. 11, 1889). So, about where Dealey Plaza is today. Wheat was a major crop in North Texas, and the mill was a successful and important addition to the growth of the city. But it wasn’t all crushing and grinding. One must occasionally participate in the world of social niceties. So when the president of the United States is getting married, what better way to commemorate the occasion than by presenting the happy couple with a romantic and self-promoting barrel of flour? Top and bottom images from an ad in The Immigrants Guide to Texas (1889). Photograph by Clifton Church, ca. 1894. Next to last illustration from Souvenir of Dallas, Texas (c. 1888). Roller mill? Right this way. Interesting! One wonders if it was the Kessler plan or the moving of Texas’ wheat cultivation to the west that kept Dallas from becoming the next Minneapolis. Or is it perhaps not even that simple?